Photographer captures wedding couple embrace in Yosemite (September 5, 2016). 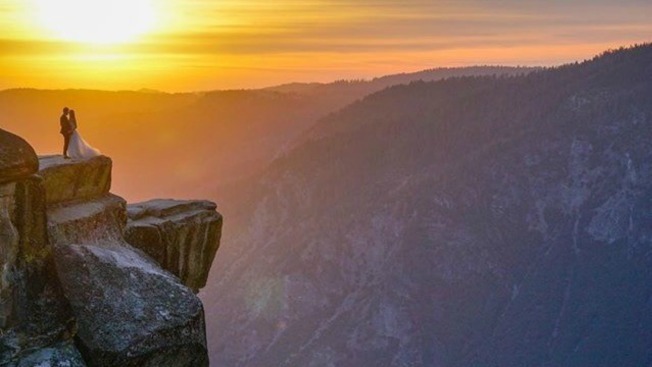 After a breathtaking snapshot of a mysterious newlywed couple embracing on top of a Yosemite ledge led an amateur photographer on a wild goose chase, the secretive duo has finally come forward. Bride Catherine Mack, who has been identified as an actress from Australia, posted the epic photograph of her and husband Rick Donald on Instagram after days of staying hush-hush about the viral spectacle. "This special moment was caught by Mike Haras who we don't know (at all)," Mack said on her Instagram. "He was just taking a sunset shot and we happened to wander into it." The photo was shared nationwide and Mack reached out to NBC Chicago in an effort to thank those that helped the couple find the stunning image. "It's really sweet," she said. "Everyone has been so kind." Karas, an amateur photographer from Hawaii, had spent nearly one week hunting down the then-mysterious duo before finally making contact with the newlyweds Tuesday night after getting their contact information from two wedding photographers who shot the wedding. "I was actually on a shoot so he gave me a quick call," Mack said. "It was lovely." The much-anticipated introduction was a special moment for both Karas and the oblivious bride. "She was laughing and happy about the photo," Karas said. "She didn't know how big exactly the story had become." Karas said the newly-introduced friends talked for roughly 30 minutes or so and the Hawaii photographer who happened to capture the magical moment will be sending some of his shots to the couple later this week. "He's given us a little look at a few of them and they're amazing," Mack said. Although some question the authenticity of the once-in-a-lifetime snapshot, Karas understands the criticism, but claims it is 100 percent real. "Those who know me know I wouldn't make stuff up," Karas said. "So, it's not a big deal. At the end of the day, all that matters to me is the bride and groom loved it and hearing her voice, level of enthusiasm about the photo and the whole ordeal when we talked on the phone was all the validation I needed. That was the reason we even sent this in the first place." The viral roller coaster ride has been wild for Karas, but he's elated to have found some closure. "It's crazy how fast something can spread," he said. "Also, social media at times can be negative, but when leveraged in the right way, it can really be a great way to do something good." As far Mack and Donald, they find the whole situation "quite hilarious." "We just thought it was quite funny," Mack said. "It's a modern day love story with social media."